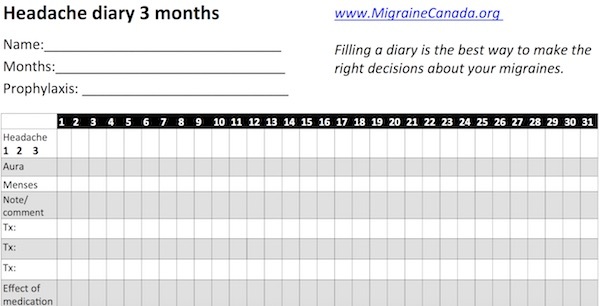 Home > Women and Children > Should my child fill a headache diary? Should my child fill a headache diary? Completing a headache diary is an essential step not only in diagnosing but also in treating your child’s headaches. Headache diaries allow you and your doctor to access an objective summary of information on your child’s headaches, such as how severe they are, how frequent they are and how often they are requiring treatment. This information will assist your doctor in diagnosing the headaches, choosing the best treatment for the headaches and in tracking the success of current treatments. Headache diaries also help to determine if there are any environmental triggers for your child’s headaches. For example, things such as sleep deprivation, stress, changes in the weather and certain foods commonly trigger migraines for certain individuals.